Affordable and nutritious wafer can be said to be a lot of kids love to eat dim sum, especially with sweet and sour homemade strawberry sauce as a snack, or with ice cream when the dessert is really very attractive to children appetite. Because of the popularity of wafer biscuit, manufacturers also gradually increased, in China, there are a lot of wafer biscuit machine manufacturers. 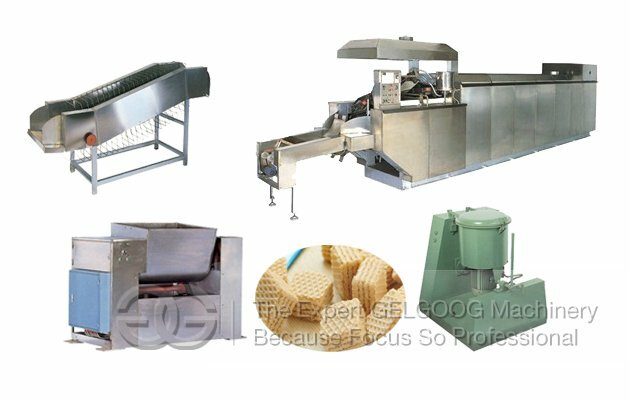 The wafer biscuit making machine from GELGOOG company, design mature, technical performance and quality, bake the wafer cake surface color and luster is uniform, the finished wafer cream evenly daub, cutting straight; Machine smooth operation, no abnormal noise. This production line has reliable performance, high output, low energy consumption, convenient maintenance, simple operation, no pollution, etc. Across various electrical and mechanical parts all use well-known brands at home and abroad, long service life. Contact food part adopts 304 stainless steel, food grade PU belt, conform to the health and safety standards. The whole line including tunnel baking ovens, splicing machine, cooling machine, general cake, cream coating machine, vertical freezers and cutting machine, conveyor, control system adopts PLC control, human-machine interface simple operation, easy cleaning and maintenance. the oven from GELGOOG is good metal insulation structure, beautiful appearance, equipped with grouting system, gas heating system, gas leakage alarm system, template transmission and connection device. Burner with high energy-saving combustion technology, greatly improve the utilization rate of combustion. Double baking room insulation structure, make the pan in the upper and lower heating is more efficient in the hearth, furnace temperature uniformity. the baking plate adopts the gray cast iron. Long service life, the best effect of heat energy, wafer cake uniform coloring built-in biscuit waste cleaning device.